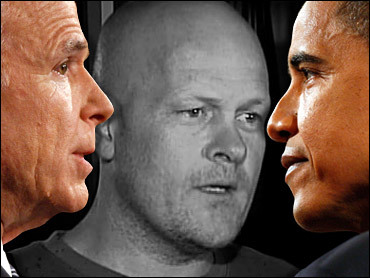 Campaigns Battle Over "Joe The Plumber"
The campaign between John McCain and Barack Obama now centers on "Joe The Plumber." Early in Wednesday night's final debate between the two candidates, McCain brought up Joe Wurzelbacher, an Ohio plumber who approached Obama at a campaign event last Sunday, to illustrate how the Illinois senator's tax policy would hurt small businesses. Wurzelbacher told Obama that his tax plan would prevent him from buying the plumbing business that now employs him. Obama said he plans to raise taxes on people making more than $250,000 a year while cutting taxes for everyone else. "He wants the government to take Joe's money and give it to someone else. His hard-earned dollars. We're not going to stand for that," McCain said Thursday at a Pennsylvania campaign stop. "America didn't become the greatest nation on Earth by spreading the wealth. We became the greatest nation on Earth by creating new wealth." Obama on Sunday told Wurzelbacher that he wanted to raise taxes on wealthier earners so lower-wage workers could receive a tax cut. He added, "I think when you spread the wealth around, it's good for everybody." Obama also referred to the discussion during an appearance in New Hampshire today. Obama said McCain was misleading voters by proposing tax plans that favor the rich while criticizing an Obama tax plan that would raise taxes only on people making more than $250,000 a year - just 5 percent of all taxpayers. "He's trying to suggest that a plumber is the guy he's fighting for," Obama said. "How many plumbers you know that are making a quarter-million dollars a year?" Reality Check: How The Candidates' Plans Will Actually Affect "Joe The Plumber"
McCain at his event said that "Joe the Plumber" was the real winner of Wednesday night's debate. "Joe's the man!" McCain said at a rally in this Philadelphia suburb as supporters chanted "Joe! Joe! Joe!" "He won, and small businesses won across America," McCain said. "They won because the American people won't let Sen. Obama raise their taxes in a tough economy. They're not going to let him do it, my friends." "For John McCain, 'Joe The Plumber' represents the one aspect of economic crisis where he may have an edge over Obama," said CBSNews.com senior political editor Vaughn Ververs. "Republicans have traditionally won on their platform of keeping taxes low and that could be an appealing message at a time when voters are feeling pinched. But these are extraordinary times and the tax issue hasn't seemed to bolster McCain up to this point." Wurzelbacher himself has suddenly become a central figure in the campaign, giving several interviews to the media since last night. After the debate, he told CBS News anchor Katie Couric that the experience of watching the debate last night was "surreal." On Thursday, he revealed to the media assembled outside his home that he wasn't a licensed plumber. He said he works for a small plumbing company that does residential work. Because he works for someone else, he doesn't need a license, he said. But Wurzelbacher still would need to be a licensed apprentice or journeyman to work in Toledo, and he's not, said David Golis, manager and residential building official for the Toledo Division of Building Inspection. State and local records show Wurzelbacher has no license, although his employer does. Golis said there are no records of inspectors citing Wurzelbacher for unlicensed work in Toledo. Wurzelbacher, 34, also said he doesn't have a good plan put together on how he would buy Newell Plumbing and Heating in nearby Toledo. He said the business consists of owner Al Newell and him. Wurzelbacher said he's worked there for six years and that the two have talked about his taking it over at some point. "There's a lot I've got to learn," he said. Wurzelbacher also owes the state of Ohio $1,182.98 in personal income tax, according to Lucas County Court of Common Pleas records. In January 2007, Ohio's Department of Taxation filed a claim on his property until he pays the debt, according to the records. The lien remains active. Wurzelbacher, who voted in the Republican primary and indicated he backed McCain, was cited by the GOP presidential candidate as an example of someone who wants to buy a plumbing business but would be hurt by Obama's tax plans. Wurzelbacher said he was surprised that his name was mentioned so many other times. "That bothered me. I wished that they had talked more about issues that are important to Americans," he told reporters gathered outside his home. Wurzelbacher said he's feeling overwhelmed. "I'm kind of like Britney Spears having a headache. Everybody wants to know about it," he joked. In Toledo on Sunday, Wurzelbacher told Obama that he was preparing to buy the plumbing company, which earns more than $250,000 a year, and said: "Your new tax plan is going to tax me more, isn't it?" Obama said that under his proposal taxes on any revenue from $250,000 on down would stay the same, but that amounts above that level would be subject to a 39 percent tax, instead of the current 36 percent rate. Wurzelbacher said Obama's tax plan wouldn't affect him right now, because he doesn't make $250,000. "But I hope someday I'll make that," he said. "If you believed (Obama), I'd be receiving his tax cuts," Wurzelbacher said. "But I don't look at it that way. He'd still be hurting others." As he leaned against the Dodge Durango SUV parked in his driveway Thursday morning, Wurzelbacher indicated to reporters who crowded around that he was a conservative, a fan of the military and McCain. He said meeting McCain would be an honor but said he hadn't been contacted by the Republican campaign. Still, the plumber wouldn't say who he was voting for and brushed off a question about whether he could influence the election or other voters. "I don't have a lot of pull. It's not like I'm Matt Damon," Wurzelbacher said. "I just hope I'm not making too much of a fool of myself," he added. But his story clearly caught on with McCain's crowd. Some supporters held signs saying: "Joe the Plumber for senator. Undeniably qualified to clean up Washington's waste." Meanwhile, Obama opened the final leg of the presidential campaign by returning to a familiar strategy on Thursday: Linking McCain to the unpopular incumbent. Obama said McCain was trying to obscure the issue in their final debate Wednesday when he pointed out that President Bush will not be on the ballot next month. "I'm not running against George Bush. I'm running against all those policies of George Bush that you support, Sen. McCain," Obama said. "In three debates and over 20 months, John McCain hasn't explained a single thing that he would do differently from George Bush when it comes to the most important economic issues we face today. Not one." Speaking at a New Hampshire apple farm, Obama said McCain frequently attacked in the debate because he has little positive to say about his own proposals. "With the economy in turmoil and the American dream at risk, the American people don't want to hear politicians attack each other," Obama told a cheering crowd as a light rain fell on a blaze of autumn trees in the background. "You want to hear about how we're going to attack the challenges facing the middle class each and every day." The Illinois senator also continued his push to capture states that have been considered safe Republican territory in recent presidential elections. He bought airtime for campaign ads in West Virginia and planned visits to several traditionally GOP states. After Thursday's appearances in New Hampshire and New York, Obama was headed to Virginia, Missouri and North Carolina, states that once were assumed to be safely in the Republican column. Now they appear to be up for grabs. Calculate your own path to the presidency with our Electoral Vote prediction map. He also is launching TV ads in West Virginia, which George W. Bush won four years ago and hadn't been on the list of target states until recently, according to two Democrats with knowledge of the strategy. The Democrats, speaking on condition of anonymity to avoid angering the campaign, said Obama is also considering putting money into reliably Republican Kentucky and may yet return to the airwaves in North Dakota and Georgia. Still, Obama warned supporters not to get complacent. "We are 19 days away from changing this country. Nineteen days. But for those who are getting a little cocky, I've got two words for you: New Hampshire," he said, referring to a painful loss in the Democratic primary that came after his dramatic victory in Iowa. "I learned right here, with the help of my great friend and supporter Hillary Clinton, that you can't let up or pay too much attention to the polls." The candidates headed back to New York Thursday after their appearances to attend the Alfred E. Smith Memorial Foundation dinner, an annual event hosted by the New York Roman Catholic archdiocese to raise money for needy children.